July 1st, 2015 – Bike tires. That’s it. The German’s at Schwalbe decided in the early ’70s to focus exclusively on bike tires. They don’t make car tires or motorcycle tires – it’s all bike tires, all the time. They don’t even make bike tires for other companies that want to get into the tire business but don’t have the know-how or manufacturing ability. Bike tires are no afterthought. A few bad bike tires can’t be offset by good sales in the auto sector or with complete bikes. Schwalbe has to get it right and by and large they have, redefining tire longevity with the Marathon line and continually pushing new technology with things like the dual chamber PROCORE MTB system Schwalbe only thinks about bike tires, and clearly they think about them a lot and lately they have been thinking about tubeless. Schwalbe launched tubeless two years ago with the One Tubeless and it’s been a well received tire. 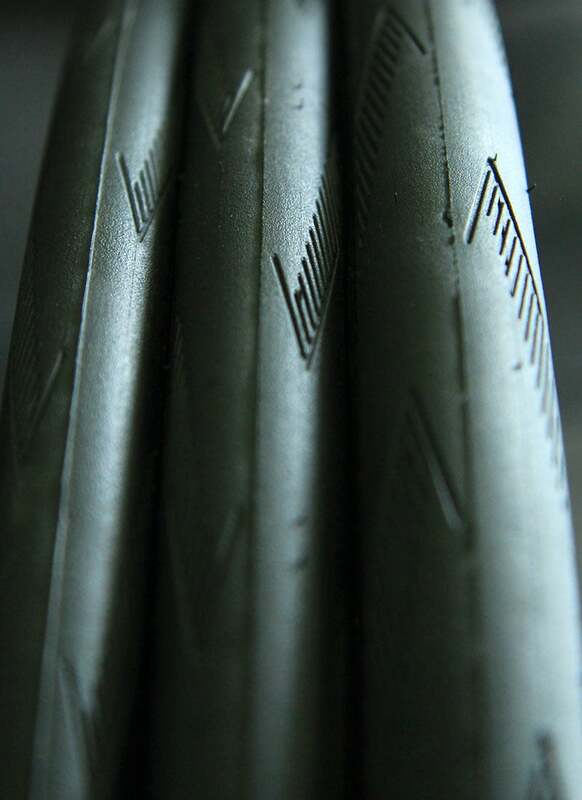 Initially, Schwalbe wasn’t sold on tubeless. They didn’t believe the advantages outweighed the issues with mounting and inflation. When they began to research it, however, they fell in love with the technology. They found not just the expected reliability, which in itself is enough of a reason to ride tubeless, but the comfort and handling improvement from lower pressure was greater than expected and then there were the rolling resistance numbers. 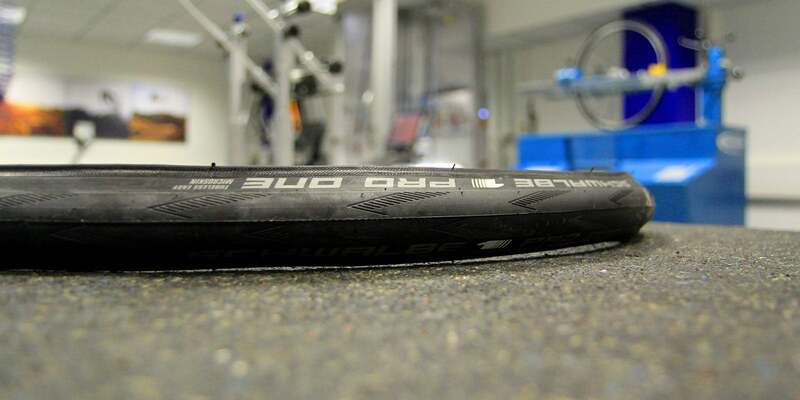 A Schwalbe One 23mm tube tire eats up 22watts of your output at 40kph. It took Schwalbe three years to create a tire with rolling resistance this low. By comparison, its Durano tire designed for longevity a puncture protection makes 29watts. A handmade tubular like those used at Roubaix can burn an astounding 38watts. 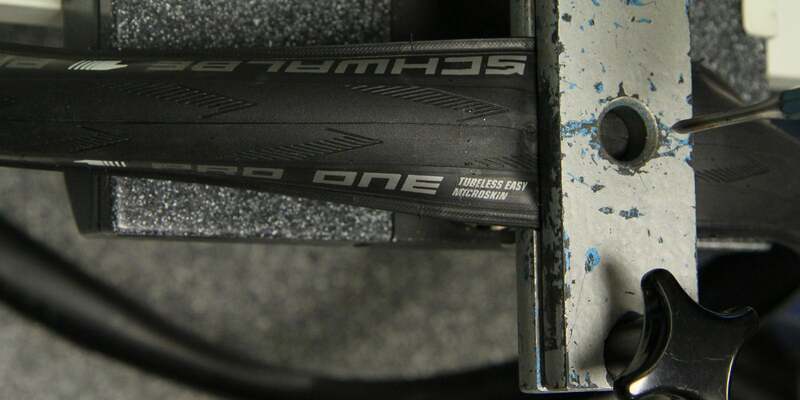 When Schwalbe finished the One tubeless and put it on the roller it burned only 19watts. Three watts may not seem like much, but the number is essentially doubled since it takes two tires to ride. Schwalbe’s long standing relationship with the Tour Trans Alp provided the final motivation they needed. Over seven days and almost 900km, Schwalbe provides neutral support and one year logged the reason for every flat tire they fixed. What they found shocked them. Bursting tubes created 30% of all flats. These tubes were bursting not due to punctures or slices but due to overheating during heavy breaking, incorrect installation or exposed spoke holes. No other single culprit flatted as many tires and tubeless would have prevented every one of them. Add the reliability of sealant and the majority of punctures and even some slices would have been prevented. In a tubeless world riders at the Tour Trans Alp would likely reduce flats by 50%. After testing the waters with the One Tubeless Schwalbe believes the time is truly (and finally) right for tubeless. There are more wheels to choose from, the systems are better understood and most importantly, the early adopters have spread a lot of very good word of mouth. To celebrate this fact they have created a tire that sits above the One Tubeless, the previous top of range, called the Pro One Tubeless. 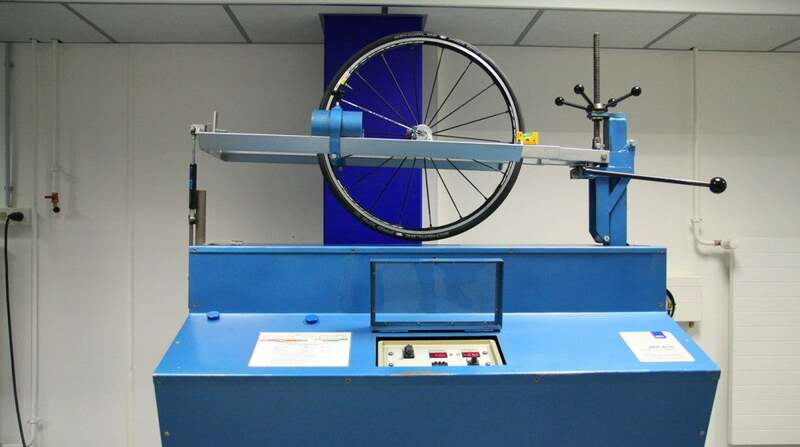 Schwalbe calls its rolling resistance test rig, ‘Der Alte’ (The Old Man). The new Pro One Tubeless beats the One Tubeless in every category. At only 235grams the 23mm tire shaves 70grams from the One, weight right where it counts at the fastest spinning part of the wheel. Even accounting for 10-30ml of sealant the tire is competitive with the best clincher/tube combos on the scale, yet is light years more reliable. It’s the lightest tubeless clincher we’ve tested, squeaking under the 240gram Specialized S-Works Tubeless and Hutchinson Atom Galactik. Schwalbe shaved rolling resistance as well, at 17watts the Pro One saves an additional 2 watts over the One Tubeless. Double it for both wheels and you’ve got a 10watt saving over a very good clincher and tube. That’s a very significant number. The main reason for the reduction in weight and rolling resistance is a new construction with a layer of monofilament woven fabric called MicroSkin. Instead of using a braided or coiled thread to create the material the monofilament is a single piece similar to fishing line. This MicroSkin does the job of two materials on other tubeless tires. It helps create the airtight seal and it provides the strength to resist pressures required for mounting and riding. It’s also adds puncture and cut protection from bead to bead. To test puncture resistance the new tire underwent torture on ‘Der Stecher'(The Stabber). The MicroSkin still requires sealant to be airtight and at least 10ml is required to set them up, so Schwable calls the tire Tubeless Easy, not Tubeless ready. 30ml of sealant is the recommended amount and while this will up the system weight a bit, it has no affect on rolling resistance. The tire’s compound is unchanged from the Original Tubeless One. Still a triple compound, it has a long wearing layer of rubber with good wet weather traction in the center, shoulders with a sticky compound for great handling and a special third layer under the second layer at the shoulders. This third layer never contacts the road, even as the tire wears, so Schwalbe could focus exclusively on low rolling resistance. The tire has a new tread pattern in place of the previously slick One. As we have heard from many tire manufacturers tread adds zero performance. It does not increase grip, does not channel water, in short it is simply for rider peace of mind. Schwalbe got tired of explaining to pros and amateurs alike that a slick tire created as much, if not more, traction in all situations so they added some purely cosmetic tread. Speaking of the Pro’s, IAM Cycling, has been testing and racing the Pro One Tubeless all year and an amazing thing has happened. The pros of IAM Cycling that were helping develop the tire spoke so highly of it IAM has had to beg Schwalbe for more tires, sometimes mid tour, because all the die-by-tradition riders now want to ride the tire instead of tubulars. IAM raced Schwalbe tubeless at Roubaix this year and suffered not a single puncture, but it wasn’t a Pro One they were riding, which brings us to Schwalbe’s new commitment to tubeless. In addition to the Pro One, Schwalbe has launched four other new tubeless tires. The IAM pros rode a tire called the S-One at Roubaix, a 30mm tire with extra puncture protection layer that blows away traditional classics tubulars with only 24watts of rolling resistance at 58psi. For ‘cross riders Schwalbe has the X-One, a 33mm, 360gram, ‘cross tire that cuts a Racing Ralph’s rolling resistance in half. While Germans may not understand the American’s desire to ride gravel, they have made us a tire, the 35mm G-One. To round out the line a 60mm tubeless tire, aptly called the Big One, has been launched for beach racing which is apparently popular in Northern Europe. They may love sand, we may love gravel, but we can still love each other. As with any tubeless set up, the devil is in the details, or at least the system. A wheel with a large outer diameter or a shallow rim bed will be tough to mount any tire on and the tough bead material of a tubeless tire can make it truly a challenge. While we have yet to mount a Schwalbe Pro One we did witness one of Schwalbe’s product managers, Peter Krischio, mount the tire with noting but thumbs on an alloy Fratelli rim. For those of us with less than German strength in our digits Schwalbe has a new tire lever that can be clipped on the bead hook to stop the tire from sliding out of the rim as you lever the last section in. Day One of the ride to Schwalbe HQ. After 145miles from Belgium to Schwalbe HQ in Germany on a set of 25mm Schwalbe Pro One’s (23mm and 28mm are also on offer) we can unequivocally attest to the tire’s comfort and traction. Unknown descents, sometimes in the rain, were ridden with complete confidence, and a rather stiff Focus felt like a magic carpet at 80psi. While the Pro One felt quick as well, more rides on familiar terrain will be necessary verify that impression. And, as always, despite dirt, gravel and aiming for more than the occasional sharp stone on the ride, we suffered no flats and in fact lost no measurable pressure during three days of riding. It would appear that the Schwalbe Pro One Tubeless, with the help of some quality wheel manufactures, has gone a very long way to fulfilling the full promise of tubeless. Better reliability, better handling, more comfort, decreased rolling resistance and weight competitive with the best tube and tire combos. Look for a detailed ride review in the pages of peloton soon. Production of the tire is up and running and every One Tubeless order has been switched to a Pro One tire, so expect to see these at your local shop very soon, priced between $80 and $90. RELATED: Specialized launches new tire as part of 5:00 aero package. RELATED: Cannondale Launches new SuperSix EVO in Austria.